Sign up for Broadjam today to follow Barbara Cecil, and be notified when they upload new stuff or update their news! IN 1994 Barbara started singing as a solo performer at state and county fairs throughout the Pacific Northwest performing her favorite kind of music, country. Anything from Patsy Cline to Shania Twain. Wanting to be taken more seriously Barbara started working with several local country bands, and writing her own music, in 1998 she opened for national recording artist Chris LeDoux and self released her first CD titled, Big Trouble Now". 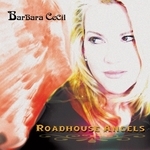 In 1999 Barbara Started "The Barbara Cecil Band and performed for one season. In November of 2000, Barbara joined a nine piece 50s and 60s rock n roll show band called "Johnny Limbo and the Lugnuts", as their only female singer, singing leads and backup harmonies. Barbara continues to write music and is working on songs for her next CD.